Maori language is compulsory - or be killed! I saw an article a few weeks ago (can't be bothered searching for it) complaining that Wellington misses out on central government funding as compared to Auckland and Christchurch. It is a pretty short-sighted thing to say, given Auckland has a huge population and Christchurch is still suffering from the earthquake. What is even more churlish is not to recognize the amount of indirect funding Wellington receives from central government simply by being the Nation's capital, and all the associated apple pies, ice-cream cones and happy meals that brings us. Arguments to super-size the council (amalgamate) are frequently lacking in substance, and most of the reasons provided are emotive. No medium size meals allowed - we simply must up-size to large fries and tall coke to get a decent McValue Rates Scheme. Never mind that super-sizing a burger combo is still no substitute for sushi with miso soup. There may be a case to be made for council amalgamation, but I'd really like to see the full menu, and check the ingredients don't include aspartame and highly processed foods with a sugar high that gives me wallet-burn. Speaking of menus, the Auckland Super Sized Council is still an experiment in progress, not a role model for the rest of NZ. Hiding new taxes on property in the depths of obtuse planning documents, and treating churches, parks and schools as ideal locations for apartment blocks is about as sensible as renting spare coffins as short term accommodation. 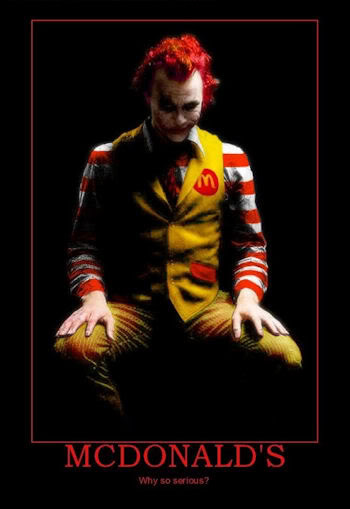 McDonald's only has one clown running the show. So why do I feel worried one clown in charge of the entire Wellington region will give me indigestion?